It’s no short order putting on an art exhibition in the Art School – the pressure to distinguish yourself, your curatorship, your chosen theme, or just to make an impression is something which must weigh down heavily on any who try. The curators and artists featured in the exhibition It’s always 5pm somewhere, are refreshingly unfazed by this tendency. In fact, there isn’t even a theme; speaking to the show’s curator Montaine Coriton Cassan, an Erasmus student from Paris, she tells me that her and the team did consider making the show about something but in the end, they decided to scrap it. Instead, they formed a motley group of artists to display the work they were making, and to see what natural dialogues formed between the works. The unintentionally cohesive exhibition runs through Manchester Metropolitan University’s link gallery in the Benzie building – located on Oxford Road – which takes the viewer into interesting nooks and unexplored spaces. Her intuitive use of the space means there’s hardly a disjoint between short film and sculpture, or embroidered tapestry and painted poem. One piece of work leads you to a seemingly dead-end, but hoisted up on the wall lies an embroidered wall hanging by illustration student Lily Mae Kroese. 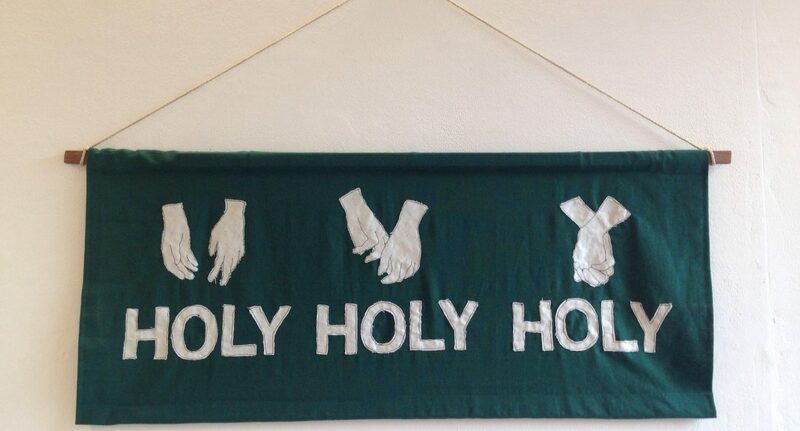 Something of an ode to Quaker wall tapestries, her work reads ‘Holy, Holy Holy’ – not as any direct biblical reference but rather a line from Ginsberg’s ‘Footnotes to Howl’. Three embroidered hands hang above the words on green cloth. What’s clear is that the intertextual dialogue extends beyond the exhibition but into the work itself, drawing connections between time and place, holy and profane, a caress or touch between discrete temporalities. Not three metres away from Kroese’s embroidery, Jasper Howard immortalises the show’s title as a large-scale meme (including the meme-maker watermarks). Howard’s stake in the temporal interactions within the show seems to be highlighting the absurd, gesturing towards our propensity for nonsensical profundity – how the internet can make something momentous out of a ‘throw-away phrase’ – as Montaine calls the show’s title. The sheer range of media reflects a desire to subvert expectations of what an exhibition ought to be, and at every turn you’re greeted with the next part of the conversation, a dialogue that is wrought in and around the gallery walls. For their first show, this group of artists have generated quite a stir, the opening evening gathering a whole host of students and artists alike. I hope they do more, and gather more talented and passionate artists to be part of this ‘no-theme’ approach to curatorship. Montaine and her eclectic group handed us a fresh perspective, let us create connections between pieces ourselves instead of handing us pre-packaged and digestible themes and meanings. If you’re interested in going to student-run experimental exhibitions, keep an eye out for things happening in the Manchester School of Art gallery space, which not only features incredible art, but also offers free wine).